All images were created by us, unless otherwise noted, so please respect our right to them and do not duplicate them in any way without permission - all images should be considered as copyrighted. The Story Tellers: The story of our trip to the Arctic is told through the voices of our dogs - Bo'sun & Gracie. We hope you enjoy the story and the photos. Hopefully, you'll be inspired to stretch your own horizons. Hi! My name is Bo'sun. I'm not the Big Dog in this outfit, but I'm Top Dog so listen up. This is a story about mom & dad's trip to the Arctic. Y'all know how popular camo clothing is now, right. Well, I was born with an Arctic Camo coat From here on, my nickname is Nanook of the North! 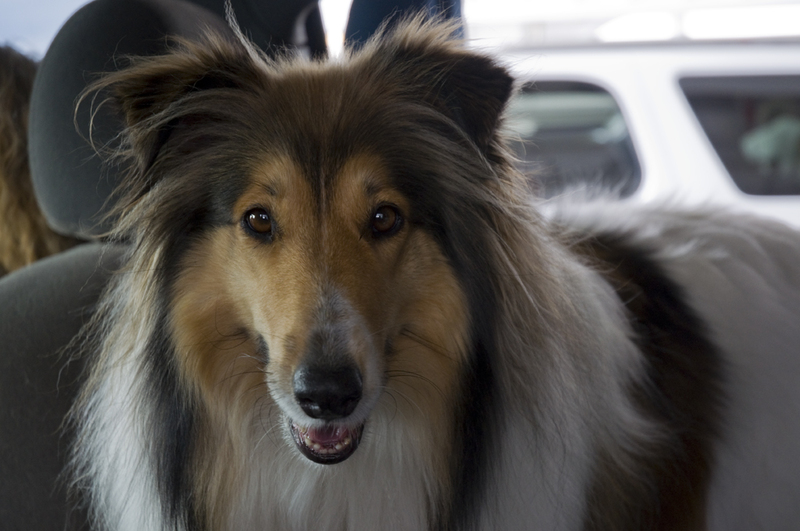 This was my second trip to Alaska, but just the first time for that silly Collie-Wollie that will be my assistant in telling the story of our great adventure. After several years of discussions about doing something special to celebrate their 25th anniversary, Mom and Dad decided to go back to Alaska instead of taking a cruise around Cape Horn. (Was there any other choice? We couldn’t go on a cruise!) 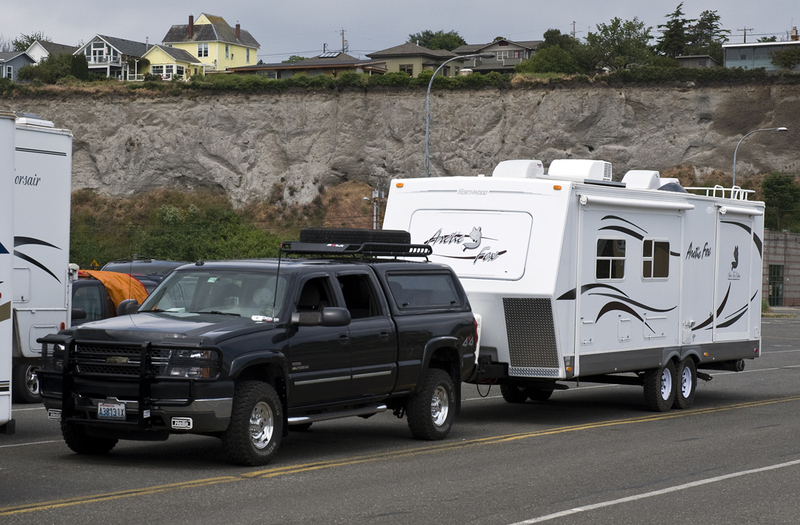 This time they are upping the ante by combining the usual RV trip to Alaska with their goal of circumnavigating North America by RV. 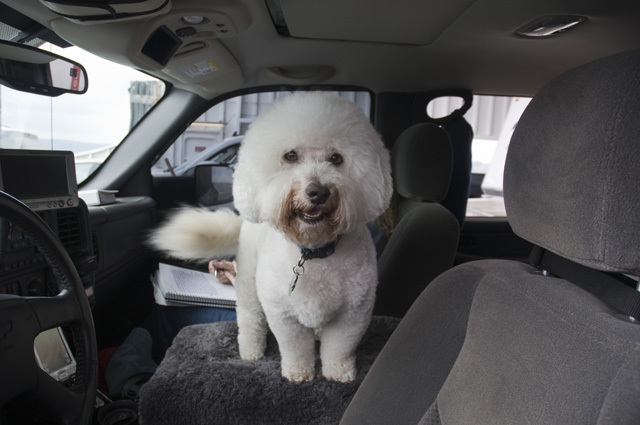 We don’t know what circumnavigating means but we’re always up for a road trip! They say something about driving as far north as possible with Dad's 4X4 truck and pull our trailer the whole way, plus the usual Alaska/Cassiar Highways. The difference isn't trivial. 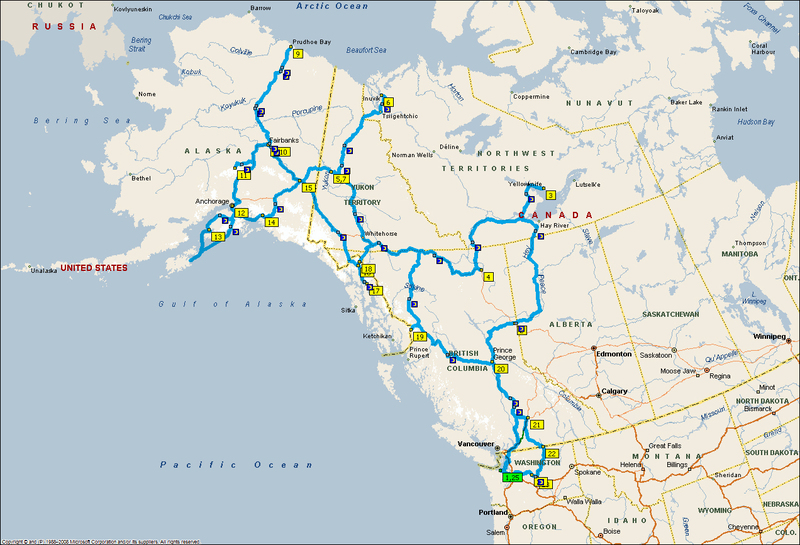 The usual trip going up the Alaska Highway & returning on the Cassiar is about 6,000 miles. We've added roughly 4,000 miles to that plus most of it is on gravel roads - very remote and primitive. Yipee! Really cool places for us to run free. They drove the Alcan/Cassiar route in 2004 in a brand new Ford F350 pulling a light-weight 1994 27' Holiday Rambler travel trailer. (Bo’sun was there but not Gracie). It was their maiden voyage in that rig; in fact, the truck was only six days old as our '97 Suburban died just a week before leaving. Preparation for that trip was extremely limited: we rebuilt the suspension and put new tires on the trailer. The truck was so new Dad installed some stainless fender flares to protect the paint from the gravel and a CB radio along the way. There wasn't time to buy a canopy for the truck, so we borrowed one. Preparation for this trip, however, was extensive. Dad and Mom (but mostly dad) worked on the itinerary, the truck and the trailer for over six months to get ready for the rigors of bad roads. Hopefully, the preparation will be adequate and we won't have too many hiccups - I hate the hiccups! Since Dad is our resident master mechanic, we'll let him describe all the stuff about the truck and trailer, modifications and upgrades via the Preparation link on the side of this page. Get back in front & drive old man! What are we waiting for? I'm loaded up and ready to go on a road trip north. What were you thinking about when I was just a kid and you took us to Arizona? Bo'sun thinks he's hot stuff with that wimpy white coat of his; this Collie has her best fur coat on and can't wait to try it out in the Arctic.